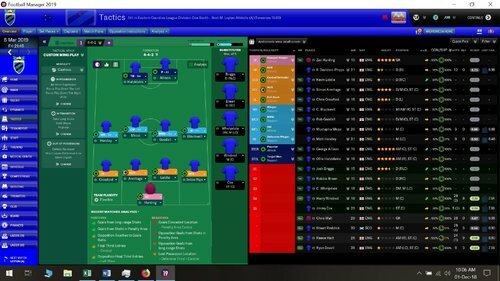 A Head Coach/Youth Academy Challenge, In Which the Chairman and Director of Football don’t trust me to anything other than focus on tactics and coaching. I’ve made a few tweaks – Ranieri at Fulham, slipped in the odd Easter egg such as Craggy Island to the lowest Irish level, swapped a few teams, altered some reputations (e.g. 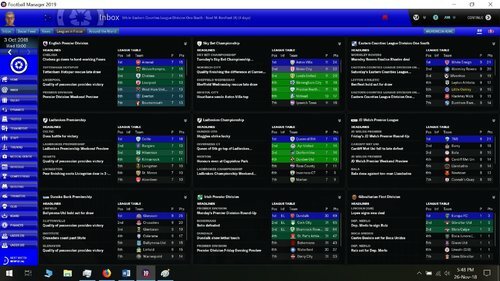 our first club’s reputation is 200; all other L10 English clubs are 400) – nothing substantial other than setting up my job. Advanced Rules – don’t add players to playable teams, untick do not add key staff, untick attribute masking. 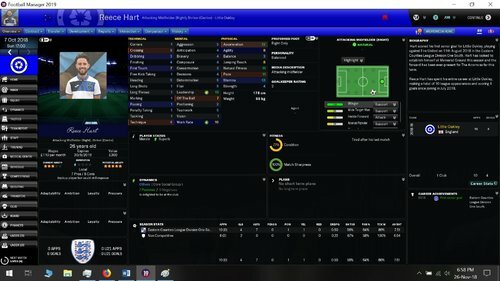 Small Database, no additions, 37 leagues, c. 26K players, 4 stars speed. Start 25/6/18. Having left Plymouth Marjon under a wee bit of a cloud, my wife and I have crossed England so that I can return to North-East Essex where I grew up, to a village team just a few miles up the road from my childhood home. 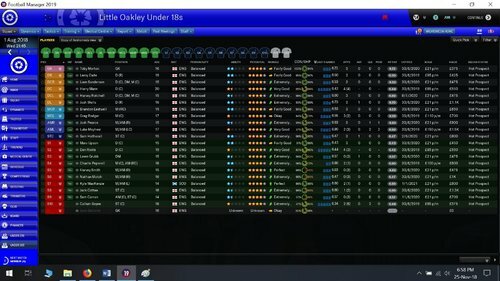 I vaguely remember Little Oakley as a sleepy nothing of a village, but my latest research shows me that this club is going places. I just hope we can be part of that journey. Here in the foreground is the village, with the football ground visible on the outskirts next to the red roof. 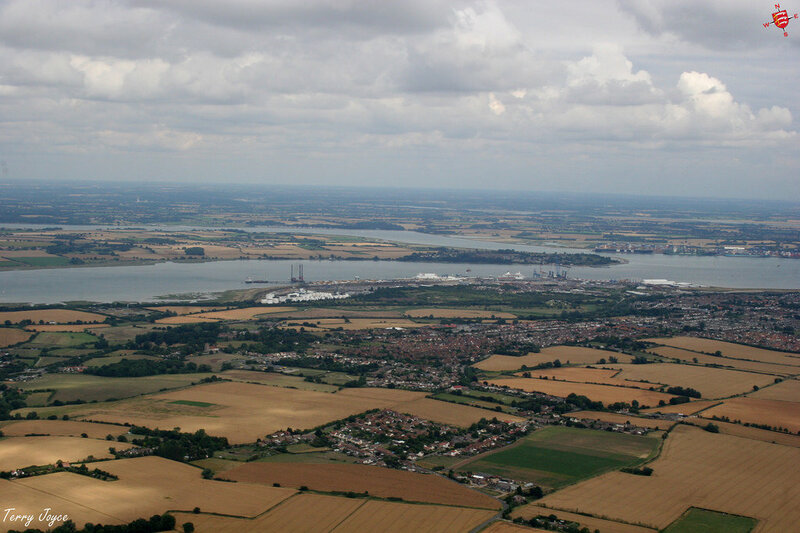 It adjoins the town of Dovercourt with the port of Harwich on the estuary of the River Stour, serving the North Sea. The football club of this rather prosperous little hamlet was promoted as champions of the Essex and Suffolk Border League in 2017 and decided to splurge a lot of cash, upgrading the ground, installing floodlights and seating. They also committed themselves to launching a Football Academy for 16-19 year-olds in the 2019/20 season. The above is very much true; in my narrative, the board over-committed and found themselves facing bankruptcy until my wife found enough in our reserves to pay the construction costs and assume the presidency of the club. I've tried to replicate the academy using the editor in the starting set-up using non-league AFC Telford as a guide. I don't know what the implications will be re. ongoing costs - we may well hit financial disaster! A further risky financial burden presented itself as an opportunity that could not be missed. 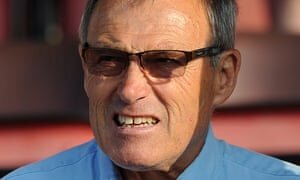 Due to ongoing historic scandals at Crewe Alexandra, the legend that is Dario Gradi stepped down and accepted my wife's challenge to join our project at Little Oakley. He's to take up a part-time position as Director of Football and Head of Youth Development. I went through the club's website and noted the names of all the players and copied player-pics where they exist. 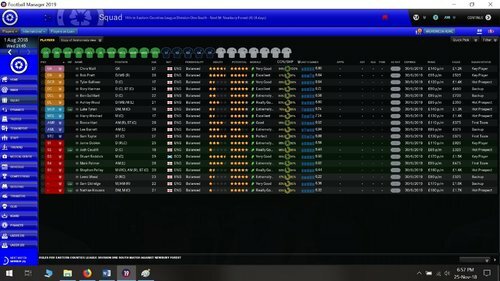 I recreated those real-life players (and staff) in the editor, giving the first team squad members CAs of between 9 and 4, reserves CAs of between 4 and 2 and the Under 18s all CAs of 1. If we can make it through the first season, hopefully the first new academy intake in March 2019 will provide better youth players. I'll leave this here while I spend tomorrow trying to add the player pics to my save and restarting to manage the club for 'real'. A very good morning to you all! So being introduced to the chairman was a bit silly given that I'm married to her and we planned the career move together. Far more significant was a first meeting with our new Director of Football/Head of Youth Development. To tell you the truth I was bricking it. I was well aware that yet again the first reaction of a club's playing squad to the news that I was to manage them was to promptly sign forms with local rivals. The hemorrhaging immediately stopped when news of Gradi's appointment emerged, with a number of players regretting their haste. Note, however, they didn't want to stay for me - they admired him. It would be so convenient to simply lay me off and have Gradi manage the club - my own missus wouldn't do that to me, would she? Not sure to be honest; I can't tell you the pressure I feel under. We don’t have a viable striker or left-back but we do have a surfeit of wingers and immobile central defenders. Dario had already said to me that he’s a 4-1-4-1 man and that formation does seem the least bad fit. I hope he’s noted the areas that could do with strengthening – I don’t feel it’s my place to say anything other than make a silk purse out of this sow’s ear. Given that the chairman is committed to developing youth in-house I don’t know if he will bring anyone in, so I might have to ram square pegs into round holes this year. And why Dario together with everyone else holds me in such contempt. I'm just gonna have to prove everyone wrong! Putting the lads through their paces against out Under 23s I quickly realized that with plenty of central defenders but few midfielders, we’d be better tweaking our formation to a 5-4-1, so that’s what I set up for the first real friendly. We’d still have to sit deep with our lack of pace, and use the wings due to our weaknesses in the middle, and whilst we had no one to finish off any chances, Dario mumbled that he’d look into bringing in a striker – just this once or something. Within a few minutes we’d conceded two to Corinthian and it was evident the three mentally-challenged statuesque central defenders needed further protection, so I dropped a midfielder into a defensive ball-winning role and shouted to all of them to improve their marking. We played alright after that even though we lost. No tactics in the world can make these guys create and take chances to score. After we drew thanks to benefiting from an own goal in the next game, the local hack wrote, “Underdogs come close to causing shock – Little Oakley have been slated by former players and media pundits (i.e. him) alike …”. I’ve hardly got my feet under the desk and the knives are out. A week ago we were under budget. That’s been blown away as Dario has brought in his chums – a Spanish scout, a data analyst, various backroom bods that I don’t see adding much other than an unsustainable wage bill. The board are already getting antsy – I just know who’s gonna get the blame. To be fair though, after I’d started a 14 year-old up front against our Under 18s and we still failed to score, he did come through with a new striker. He’s too old at 27 but looks fairly quick and is quite full of himself, but I didn’t see much technical ability or footballing intelligence on the training ground. He’s got to be an upgrade merely by the fact he’s breathing, so he was straight in for the next game. Dario also tried to bring in a 16 year-old kid as back-up but the boy was too greedy. At least our DoF is starting to show some restraint spending our money. After shifting nine goals in two games, our next friendly was intended as a money-spinner against Peterborough. Fortunately, they were happy to cruise to a 1-0 victory without humiliating us and the gate did put us in the black for the month. The thing about part-timers is that they get little time to train together, so it takes a while for them to get to know each other and my tactics on the pitch. In my last job it took seven matches before I chalked up my first victory, and then we were on a roll; however, the decision had already been made. I just hope this time round I receive the requisite patience. So what happened to pull us out of the doldrums was that in the last friendly for our first team, the opposition very kindly gave themselves two red cards in the first half, allowing us to finally gain time and space to find the old onion-bag. A few days later our back-up eleven finally won a game. So, we go into the competitive season feeling a whole lot happier than a week ago. It doesn’t look as if Dario’s going to supplement that one player he acquired, so here is our entire first team squad, and Under 18 squad (the U23s is empty). In that U18s squad I don’t think anyone other than Luke Mayhew has any potential. Now, with one game per week (subject to the weather but we have an artificial pitch), hopefully we’ll be okay with injuries and suspensions and not need to call up any of the back-ups to the back-ups. A couple of days prior to the big kick-off I spent the day with our data analyst, Daryl and Dario and went through our tactical instructions with a fine toothcomb. I figured that the lads by and large just ain’t that bright, so I pared things back. ‘KISS – keep it simple, stupid’ I told myself. For the five defenders, just get rid, welly the ball up the park, that’s it. No fancy-dan wing-backery either. Hoof it to the flanks and keep your position. I encouraged the smarter players further away from our goal to use their noggins, but really my priority was battening down the hatches and seeing if we could scramble the odd goal. Half our league comes from rural Essex and half are London scum. And so it was that we travelled down to the Big Smoke to face the admittedly rather charming and actually smoke-free Newbury Forest on the historic day of 5th August 2018. The boys’ spirits were up after that last week’s results as lined up to shake hands, despite the odds being well against us. I got what I wanted – our defence soaked up a lot of pressure and almost held out, while offensively we did nothing other than fluke a goal. Our new striker Sam Taylor continued to be perpetually caught offside – six times in the first half before I hauled him off. Trouble is, there’s no back-up. Still, 1-1 away – I’m taking that. The following week out first home tie was against Fire United. I was expecting a fleet of fire engines to rock up from Lewisham but they turned out to be a bunch of happy-clappy Christians. We didn’t have a prayer. They crucified us. But on the third day we rose again and nabbed a brace of late goals - 2-2! Despite the poor attendance, we did get a healthy income from the match, thanks to the supporters passing around the collection plate. We rolled down the road to Halstead for the next fixture. They’d played on the Wednesday, lost and incurred a red card, so maybe we had an advantage. We started by giving them a comedy own goal but for the second week in a row we crashed in a brace in the last ten minutes. 2-1. Enjoyable read. Dario is getting on a bit though , wonder if he'll retire at the end of your first season? You've probably seen that Claasen has figured out how to replicate the L7 and L8 playoffs? My own save will have to wait whilst I try to understand how he did it and transpose the rules into Dan's file (Dan has all the nice little extras like geographical limits to leagues). With our first victory under my belt (or, if you choose to squint at it through a certain light, five games undefeated! ), the fifth column local journo and his alleged ex-player sources have put their knives way for now, and I even allowed myself the quiet luxury of wondering to myself, ‘Dario Gradi – what is he actually for?’ In the course of escalating our wage bill, he’s brought in one old, useless player. Other teenage prospects he went after have run a mile. He’s going to have to do something – despite having a number of so-called leaders in the squad, there’s not one squad member with a determination of over 5, meaning there’s no senior player to mentor the youths, which is probably not an issue for now as none of them has any real potential, but what about the academy kids coming through in the future? Without any influential chaps to guide them, we could get into a vicious cycle, undermining the investment in youth the club took such a brave chance on. At least, given he's 77 now and had been on gardening leave for two years, maybe Gradi doesn't have the stomach to steal my job anyway. Next up was our first local derby, at home to Wivenhoe – the site of Essex University which I associate from my youth as a place obscured by a constant haze of pot smoke. The team played their home games at the university in my school days. Would the team be full of hippies and communists, I pondered? More recently I recalled their glory days in the early 90s when they reached the Isthmian Premier, level 7, and later employed Julian Dicks as their manager. What a pale pale shadow of that side they are now although to be fair, they did win a remarkable six promotions in double-quick time before imploding, so they could serve as an inspiration for what we want to achieve. We had the by now requisite two goals in the last ten minutes although this time it was the opposition who equalized in time-added-on, leaving us a little disappointed to come away with another 2-2 draw. Into September and our encounter with the Wyverns of Wivenhoe was succeeded by the Worms of Wormley Rovers, an unfancied side from a Hertfordshire village seeing out August topping the table with a 100% win rate. Would Border Control allow them into Essex? Would the next David Bentley be playing (he comes from the village) Could we stop them? Yes, no and no. Our expected defensive lapses and poor chance creation finally emerged and our unbeaten record was over. 0-2 The one interesting element was the introduction of a 15-year-old defender, born in 2003, at halftime. He was our best player, and he’s supposed to be a midfielder! I decided to start with him the next Saturday along with another 15-year-old midfielder at the back. It’s a helluva risk but I needed the defence to avoid complacency, and the next match was against Holland-on-Sea who are pointless, bottom and none too prolific. Despite that set-back, our recent form had given me the confidence to be firm in my first player revolt. One of the most senior players and club captain before I arrived, right-back Rob Pratt had been kicking off. His performances have been very poor bar one good game. I spoke to him about it and his minimal efforts in training and he was pretty nasty. I made him play a couple of games in the reserves and he barely turned up. If he wasn’t going to play his way back into the starting line-up, I felt he should be demoted to the reserve squad. Yes, I knew it would be hard for a player of his stature to accept, but he was doing nothing to merit any other course of action. I asked Dario to shift him out without knowing whose side he’s going to take, but no one wanted him anyway. Down at Clacton-on-Sea to play Holland, how would out 2 15-year old central defenders do? And how about my crazy decision to recall Rob Pratt after seeing how consistently useless the new right-back has been? A goal in the first minute from a superbly-taken free kick by out skipper Stuart Reddick put us in the mood, and when we scored a 5th-minute penalty our defence hadn’t even seen the ball yet. However, when they did soon after the dozy muppets gifted them two goals. Back to square one for the second half and a substitution. I told them to be more positive but that didn’t work when Sam Taylor kept spurning easy chances. I was about to haul him off for another young kid when he lashed in a beauty from outside the box and then danced around the keeper for a second. Where did he find those in his locker? Our older defender, Rory Harman, added two identical headers from corners to seal a delicious score-line of 6-2. Actually, in that second half, everyone played like real footballers. I wish they’d be more consistent and professional, but, savouring the moment, I felt like it was my best day in football (so far). I even dithered over ousting the Pratt. He continues to stubbornly refuse to shift his arse in training, but maybe I should just bite my tongue and bide my time until someone better emerges. Next up we hosted a nice bit of posh from Burnham-on-Crouch. The Ramblers were no slouches mind, they were faring well and had a demon of a striker. Would our positivity from the last result drive us forward, or would the more sobering observation of our form, beating clubs beneath us and losing to those above us, be the determining factor? Neither really. Pratty played well but it was our unassuming left-back Ashley Wood who scored the game’s only goal, albeit from a defensive howler. For the last five minutes, I gave a run-out to our youngest ever first-team player, the barely-turned-15 striker Sam Hatherall. I was going to introduce him in the previous fixture but Taylor was on a hat-trick. Given the latter’s woeful inconsistency, we should be seeing more of the boy. So, never mind the performance, feel the result – 1-0. The final match in September was against the overwhelming league favourites, Braintree Town Reserves. They’re not doing that well, largely because their parent team is struggling and reserves stalwarts keep being called up; nevertheless, they have quality and should be too good for us, certainly if we play as flatly as we did in the previous two games. It's a funny old game. Completely outplayed, we thumped them 3-0. The defence held firm while right-winger Reece Hart took his two chances then laid on a superb cross for fat Harry Windred to get his bonce to the ball. We end the month in 5th place – who could have foreseen that? Let's have a quick look around the nations - no great surprises, other than Wolves joint-top of the EPL. As news broke that East Anglia’s finest, Norwich City had sacked their manager, we left this Sceptered Isle to take a long sea-journey to Canvey Island, home of Benfleet. They made an awful start to their season but they’re undefeated in three, so we can’t be complacent (and with our consistent inconsistency it would be very foolish). I try to keep to the same line-up and tactics but the defence in particular always looks full of holes. So I gave a first start to 17-tear-old Tyler Sullivan who’s been looking committed in training for a few weeks now. 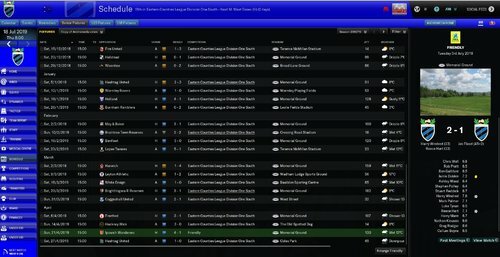 I dropped the 15 year-old Liam Sanderson who played well in the last game but rarely strings two performances together. He’ll be back later. I’ve got four right-backs but three of them are amongst the worst players at the club so I’m forced to keep faith with Pratt who’s still performing well over 90 minutes while hating me over seven days. The result was a very solid 2-0 to us with most of the players performing very pleasingly and following my tactics to use the flanks to a T. The full backs and wingers were outstanding, and left-winger Mark Palmer waded in with both goals from Hart’s crosses. Sullivan on his debut proved wobbly so he came off at half time along with Mr. Offside Taylor, and two fresh-faced lads re-appeared to do okay. With teams above us dropping points we’re up to 4th and four points off the top. I haven’t gone into detail about any individuals because they all looked to be so poor I figured few would be here for the long-haul, but Reece Hart is turning out to be the real deal. Four goals and seven assists with only one poor game in 10, he’s the one guy I can depend on. With improvements in his work rate and leadership qualities, I could consider giving him the captaincy next season if he continues like this. For the next match we hosted a newly-formed club who hail from West Ham. The chairman, one Lopes Tavares, has named the club after himself. My missus informed me she’d be busy painting her nails on Saturday and that she’s wasn’t that into egomaniacs. The team’s on a tidy run of form mind, so we’d have to be at our best. We weren’t, and Chris Wall our goalkeeper was keeping us in the game at halftime. I hoiked off the useless Sam Taylor yet again and threw on the fresh kid Sam Hatherall, who grabbed a brace and Player of the match award. All three goals were long punts from Wall; the first was knocked down by Hathersall for skipper Stuart Reddick to sweep home, and the next two were identical as Hathersall beat the offside trap (Taylor!!) to sprint clear and beat the keeper. Barely 15, that’s got to be some kind of a record. Liam Sanderson, older by a few days also came on for the disappointing experienced Jamie Dobkin, and another teenager, midfielder Charlie Peperell soon joined for his debut to give us a very youthful but transformed look in the second half. 3-0 to us, and we’re 2nd. Lovely. Feeling buoyant, we were up for facing our nearest and bitterest rivals, Harwich & Parkeston. Our boys all go to school there, a proper town who’ve patronized our little club for decades. They like to tell us how they made the FA Cup six times, playing Crystal Palace and all that, but like Wivenhoe, they have fallen a long way from their Isthmian pinnacle since then and the future belongs to us, the sometime little acorns will grow into mighty oaks right? A point needed to be made. Obviously Hathersall made his first start, and Wall was instructed to welly the ball as far as he could. I correctly figured that the Harwich manager would not bother to send anyone three miles down the road to watch our last match and suss us out. Young Sam’s not that quick, but he’s smart enough to time his movement, in contrast to the quicker-limbed but slow-of-thought Taylor. And we blitzed them. Hathersall scored, and Reece Hart bagged our first hat-trick for a 4-2 victory. With Wivenhoe slipping up, we’re only a point shy of the top! With everyone positive and training well – even Pratty, we’re a happy camp right now. Sounds like you have a decent tactic sorted. Did the Lopes Tavares team contain Portuguese nationals? IRL they are an expat side, and Dan set their local region to Algarve in the editor, presumably to model this. Yeh, I'm surprised my tactics are kicking in as the players are so damn awful! The shift concerned the goalkeeper. His distribution is awful so I instructed him roll out the ball to the defenders, so he'd kick the ball in the general direction of the centre circle and straight back to the opposition (an ME error, I reckon). When I lost patience with the perma-offside striker and put the 15 year old on instead I had the keeper launch the ball over the heads of the opposition defence and suddenly old-fashioned industrial route one tactics were bringing home the bacon. 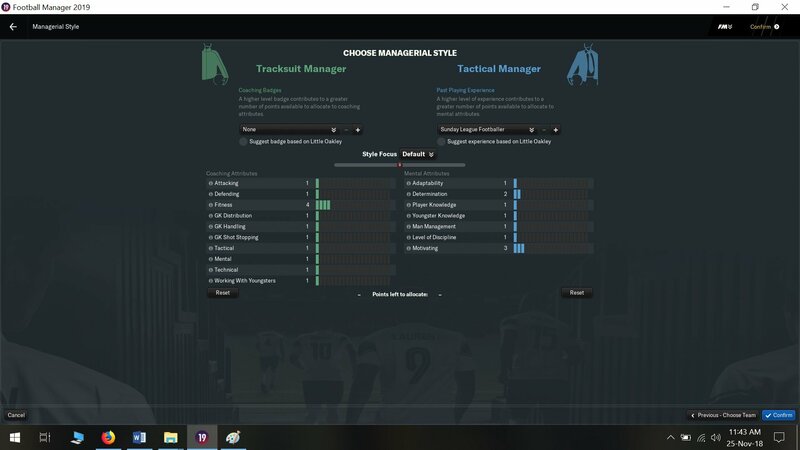 I made some other tweaks to get all parts of tactical familiarity to shift to full(ish), and I suspect the high morale all round contributes too. I look up upcoming opponents on wikipedia and sometimes pitchero or their own websites and twitter accounts to add some details. Re. Lopes Tavares no, the players are all grays. 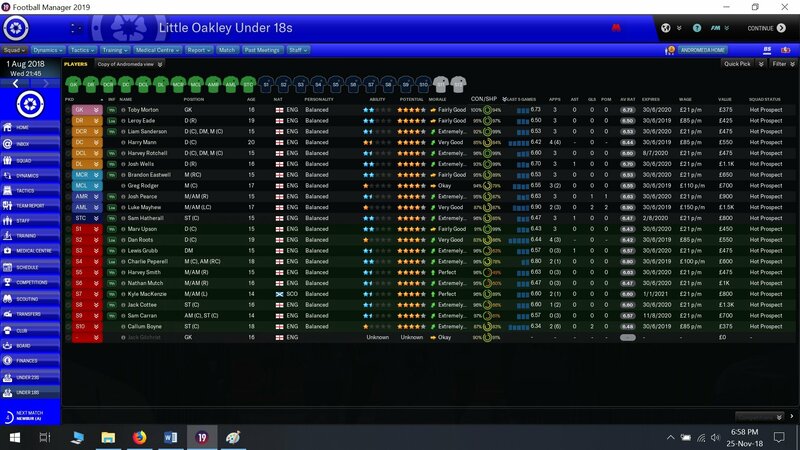 See, I used the editor to add real players to my Little Oakley squad - 39 in all with half being from their U16s. But when I tried a holiday trial with 'players for playable teams' ticked, the AI added another dozen players with CAs 10X higher than what I'd created. To prevent that and make my challenge as tough as I wanted it, I unticked it but that means grays for everyone else. Can't find a happy medium, I'm afraid. Presumably all opponents will be full of academy intakes in a few months. If you add the players at the start they're all English with Portuguese as second nationality & have Portuguese names. A very interesting team!! 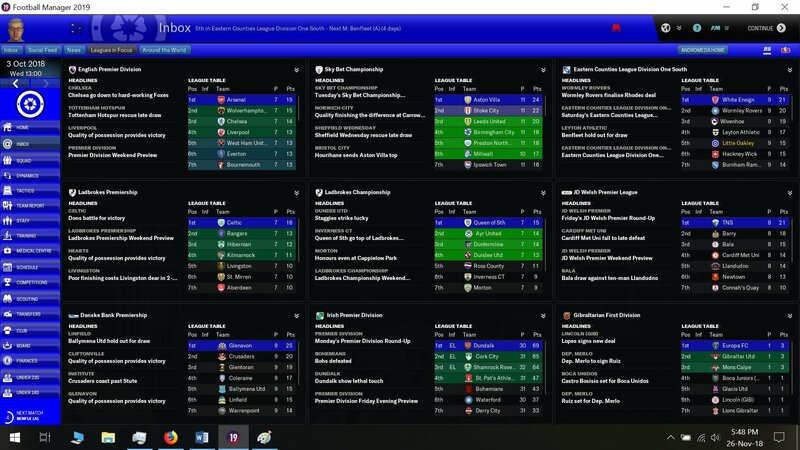 Never seen something like this on FM ever. Really interesting to see you go down even lower than the level that I actually play at (and I wouldn't say I in anyway deserve to ever feature on FM lol). Cool series man. Cheers mate, appreciate it. I'm well aware that my writing style is very different to everyone else here, and as such will not be of interest to many, but I can only play the game the way I enjoy, and write the narrative in the style that comes from within. Honestly, if just one person is entertained, I'm fine with that! For our last match of October we hosted the denizen of the concrete jungle known as Walthamstow, the club being another newbie, Leyton Athletic. They had a very strong squad and had started the season brightly, but they’d stumbled through October and hadn’t scored in four, so we were meeting them at a good time. As much as I don’t like to interfere with a winning line-up, I can’t help tinkering and noting a pattern of young players coming in and demonstrating more verve than the old dogs, I decided to restore Sanderson at the start and drop Dobkin to the bench. Another Under 18s defender is showing promise on the training ground, so I’m monitoring that too. The game itself was utterly uninspiring, stuck in midfield with no chances worth remembering created. 0-0 It was enough to enable us to overtake Wivenhoe who suffered a home defeat, but we’re still second as our next opponents, the Basildon Boys of White Ensign took top spot. So our first game in November was to be a top-of-the-table clash at home to White Ensign, who are based in Sahfend despite playing at home in some athletics stadium in Basildon. If we won, we’d go top. Sensational! The boys were excited and put a full effort into training that week, focusing on both defending and attacking. I trusted that the same line-up that fell flat against Leyton would be transformed at our Memorial Ground given the circumstances. But then on Friday morning I was a bit dismayed when I called Sullivan and Palmer to commend them on their training the previous evening and they both blew me back. I felt I couldn’t drop Palmer as his back-up at left-wing, Barrett, was going through a sustained period of poor form in the reserves, but Dobkin was waiting for his chance to get back in the starting line-up in defence, so I made one switch. These details are important, and it was a game of fine margins which we took advantage of for a 2-1 victory. I had to haul off Pratt for the third consecutive time – now he’s happy with me again, he’s not putting in an adequate shift. But Sullivan came on and played like he had a point to prove. So we’re on top! 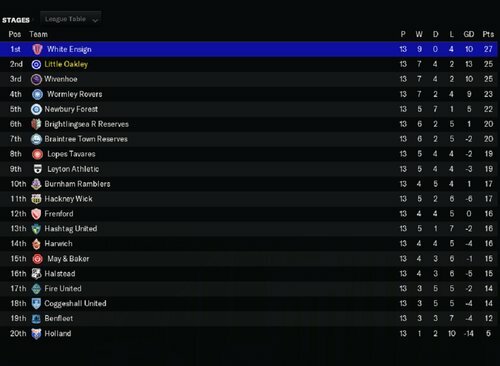 The league itself might be a new creation, but we’re playing at level 10 of the English pyramid and we’ve never been in a higher position in our history! With our next match being put back a day to Sunday, I took the opportunity to call my backroom team together for a meeting. I felt that yes, our results were spectacular and yes, while some of them were perhaps a little undeserved due to sub-par performances there was little we could do to reduce inconsistent performances with part-time players. However, in the absence of any sports scientist sorts to offer professional analysis, my gut feeling was that some of the players could put more effort into weekly training, and I instructed the coaches to devise extra individual programs for a number of them. I warned the physios that where I’ve miscalculated, they’ll probably have a little more work on their hands, and to the coaches, I emphasized that they must report to Dario and myself who articulated resistance, as it was now time to start to sort out the men from the boys. The match took us to long-time local rivals Brightlingsea Regent to take on their reserve side. Like Braintree, their mother-side was struggling, causing their reserve team to underperform in our league, although we had to be mindful of the quality of many of their players, who did recover quite well through October. Our travelling support would be enjoying themselves regardless, teasing the club about the seating being bought off eBay. For me, the visit would bring back distant personal memories of 1995 when I was a warrior in the ‘Battle of Brightlingsea’. My pep-talk clearly inspired the boys who battled hard, took control of the midfield and beat the R’s out of them 4-1. Two points clear! The next weekend we hosted a club from Coggeshall, a beautiful historic village whose residents have had a reputation for being soft-headed bumpkins for centuries. 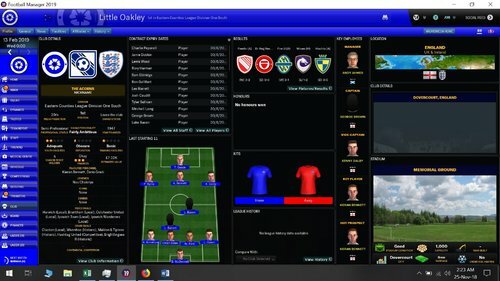 We’ve been playing Coggeshall Town our whole existence, it being one of the oldest football clubs in the world, but this year it’s Coggeshall United we meet, a club that’s all of five minutes old, being founded just last year with a popular Ghanaian journeyman being player, manager and chairman. He’ll have noted the managerial sackrace has just begun, as United are struggling themselves, but he’ll be thinking his position is even more secure than mine! I just couldn’t decide what to do about Rob bloody Pratt. He’s stinking up that right-back position and I’ve hoiked him off at half-time four matches in a row. Trouble is I have no specialist back-up and have to replace him with centre-backs. On the one hand, this might be the right game to drop him; on the other hand, we do keep winning. My final decision was to put him on the bench with Dobkin shuffling over to the right. Young lads Sullivan and Sanderson would join Harman in the centre. This was the first match in my career where the bookies made us favourites. I didn’t really welcome that and had to warn the lads not to be complacent. Alas, a cloudburst over Friday night washed out the fixture anyway, but that gave me the opportunity to use the same line-up in Sunday’s reserve games. That exercise turned out to be less than useful as the players just treated them as a training ground exercise, particularly Pratt who was a disgraceful example to the Under 18s boys. I confronted him with entirely predictable results and promptly instructed Gradi to get rid. My carefully prepared and successful playing and training regime was badly disrupted by the rescheduling of the Coggeshall match for a Wednesday, meaning we had 3 games in the following week to see out November. Would out form and positivity carry us through, or would tired limbs cause tired minds and bring our run to and end? There’s one person I wouldn’t be turning to – this time a quick offer for Pratt came in from Atherstone, down the road from my sister. I didn’t hesitate to tell Dario to close the deal. He did. I was a little miffed to know we’d still be paying eight quid a week of his wages, but what the heck? He was gone out of my hair. The first part of this intense week to us into the monotonous southern concrete jungle, this time labelled ‘Ilford’ to play Frenford. It was a case of ‘go in, do a job, get out and breathe the fresh sea air’. And that’s exactly what we did; awful game, never mind, Sam Hathersall grabbed the only goal, 1-0. Stephen Polley made his debut at half time – a decent prospect at right-wing but kept out all season by the imperious Reece Hart. On to the rescheduled Coggeshall United match and all the lads looked fit enough except for fat Harry Windred, so teenage Luke Tynan stepped up for only his second start. He did all right and set up Hathersall for a tidy goal; unfortunately we got done on the flanks as our backs and wingers just couldn’t keep up with the fresher legs of the opposition wingers. In stoppage time Ashley Wood lost his man on a corner and we lost 1-2, losing our long undefeated streak of eight matches. That stung; could we rouse our minds and bodies to face Hackney Wick in three days? I was really looking forward to welcoming the boys from Hackney – we’d known them as London Bari, a great bunch of South Asian London lads who had gone through some administrative issues, merged with the newly-formed Wick and relocated to Clapton’s Old Spotted dog ground. However, my preparations were shattered. WTF is Gradi doing? In asking him to shift out Pratt I’ve gone and let the genie out of the bottle. He’s brought me in one player all season and move done out. 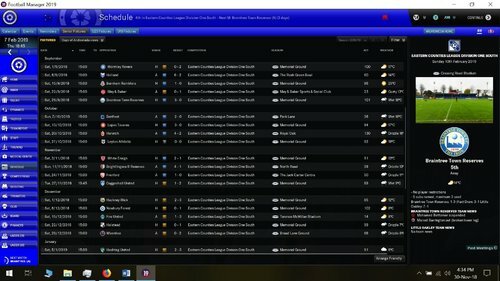 Suddenly he’s accepting bids for every player scouts are asking about – in two days without even warning me, he’d agreed to move on for free no less than four of my key first team players and a backup. I tried to schmooze them into spurning the interest but my efforts back-fired as they all saw through my obvious toadying. The disruption proved absolutely devastating as the boys clearly had their heads elsewhere – particularly Ashley Wood who badly let us down yet again as we went down 2-3. Is the dream over? Key inside left and scorer of six goals, Mark Palmer was the first to depart for some Spanish-themed club in faraway Middlesex. A mid-table club playing at the same level of football, a higher standard of living on a pay cut? Too old for you Gradi? It was hard to prepare for the next game not knowing how many would have buggered off before the kick-off, and I barely noted that we’d reached the half-way point of the season and had played each side once. The first reverse fixture was to be Newbury Forest with whom we’d opened out league account with a 1-1 draw back in August. “Can’t think of anyone myself chief,” he replied coldly, “That’s your job.” “Dario, what are we paying you for, exactly?” I’d be having words with my wife, but that would have to wait as I urgently needed to teach some sod how to play left-back and integrate him into the side with kick-off only a few hours away. I decided to slip 15-year-old Sanderson over to the left and give a debut to two teenagers in the centre. That back line was a disaster but it was the best I could patch up for the day. That we only conceded one goal to Newbury Forest was commendable in the circumstances; unfortunately, those same circumstances meant that any rhythm and understanding we’d build up over the months was lost and we never looked close to getting the ball on target. 0-1. That we were still in second was a technicality really, having now lost three on the trot and with further player defections pending, was not a run that looked like ending any time soon. After the last game I’d conclusively realized that Lewis Wood, right-back prodigy of Pratt and brother of left-back saboteur Ashley was on a mission to throw our games so I told Gradi, who was almost certainly orchestrating his way into my job to send him the way of his two treacherous co-conspirators. Sanderson would move to the right and a 15-year-old untried left winger could have a go at left-back. In the midst of our Tuesday training session Gradi brought in a 21-year old right back he’d just acquired. He’d been released by Carshalton apparently, which initially struck me as a bit of a trek until my missus later informed me he’d been made the highest earner on the playing staff. He also called over one of the young defenders I’d just given a debut to and informed him he’d just been flogged to yet another nothing London club. The new right-back, Rio Davidson-Phipps, didn’t look to special in the training session, but I’d have to hope he came through against those flaming Christians of Fire United as we headed to their London Golgotha. The fire-worshippers had us for supper. 1-3 was the score, the new guy proved to be a complete waste of salary and the whole team created nothing of note. We have been gutted like a kipper thanks to Gradi. I can’t even get back to the drawing board until I know whose names I’ll have left to scrawl on the team sheet. Our first ever victory had been at Halstead, and we were due to cross swords again. They must have sensed this was the ideal opportunity to belie their lowly position and come at us like jackals, and they did, but this time our defence held out, aided by heroics in goal from Wall until we unluckily fell to a stoppage time goal to lose 0-1. In contrast to our defence, our offence simply downed tools and showed nothing. More changes will be afoot for Wivenhoe. It doesn’t help that the fans and board are focusing on my inflexible tactics are the cause of our five losses in a row and not the six players yanked away from my first team in rapid succession. What is wrong with people? I’ll tell you what’s wrong – the skipper led a delegation of twelve players to complain about the atmosphere in the changing room. I pointed out that winning games would help that but they weren’t having it and damned me for not having a magic wand to wave. What happened to reason? For the game at rivals Wivenhoe I experimented with an untried 15 year-old striker who’s slow but tall and for the first time we tried lobbing high balls into the box. I dropped Taylor from the bench to accommodate him and another untried kid. That was enough to send Taylor scurrying out the door. Since we’d knocked Wivenhoe off the top, they’d gone on an even worse run then us. They still beat us 2-0 as we failed to muster any attacking dimension. They poor lad I put up top tried a bit too hard and got himself sent off. I blame myself for that one, but the experienced players are just not turning up at all. I had a sleepless night analyzing what’s gone so wrong, and I’ve come up with my conclusions. I’d be interested in any feedback either confirming or challenging my views. A. Immediate cause – heavy rain on the night of Friday 16th November. Seriously, I’m ascribing the direct cause of our losing our way to that night of rain. We were on a fantastic run and had just ascended the top of the table. The Saturday match at home to Coggeshall would have been a breeze had it gone ahead, but it was put back ten days. We won the game the next weekend against Frenford but that was followed by the 3 games in a week, which we couldn’t handle. We lost the midweek re-match against Coggeshall and the five subsequent matches (so far). But why would one rained-off game make such a devastating difference? B. Deeper cause – Determination. ALL my squad have a Determination attribute of 5 or less, and in fact of those with 5 only Reece Hart is not an Under 18 youngster. Even our captain Stuart Reddick only has 4. When we’re winning we’re a bunch of happy bunnies and even a trouble-maker like Pratt can’t upset the atmosphere. But as soon as we lose – just once – heads drop, and there is no one to lift them. That’s why it’s so easy to descend into a downward spiral. Maybe I’ve been focusing the blame on Gradi too much. I think what’s happened is that there was a surge of interest in our players because we’d gone on a record-breaking run and word was going around the non-league circuit. Had it not been for that rainstorm and we’d continued our winning run, the players would probably have brushed off the attention, but with a couple of poor results those players suddenly didn’t want to play for the team anymore, and indeed most who stayed didn’t appear to be any more committed. In the short term – nothing. There’s nothing I can do. I will have to remain patient and hope that the board remember that at the start of the season all that they asked of me is that we don’t finish last. It’s always possible that we meet another team even more screwed up than we are, or that we fluke an undeserved result somewhere and the boys gain some self-belief. I can continue to try out unfancied Under 23s and Under 18s, and tweak tactics on the basis that promotion is beyond us now and there’s nothing to be lost by experimenting for half a season. But really what I have to do is hang on until that magic date in early March when we get our first intake from our new academy. On the one hand, it could be that this low determination is part of our club culture and can’t be got rid of; hopefully though, we’ll get some kids with not only good characters, but a sense of loyalty to the village and we can start building some solid foundations. Ever the optimist, me. We’ll see. And so it was that I spent the training sessions preparing a scratch team of untied kids from our 16-year-old keeper to five substitutes without a start between them. They were selected on the basis of whether they looked as if they had a flicker of fire in their bellies (those I deemed lacking played in an Under 18s fixture which they promptly lost 0-9, confirming my intuition. I’d also noted that with six months left on contracts, Dario had informed me that only three first team players had agreed to sign new contracts). Our next opponents were the one side in our league we hadn’t met yet, the celebrity circus that is Hashtag United. It was a fixture the whole village was looking forward to with excitement for six months, but suddenly it didn’t feel like the right time. Wearily, we arranged for all their cameras and palava to invade us, and I just prayed the attention would add something to the games of our youtube-generation boys. The result was 2-3, another defeat, but this time whilst the inexperienced defence was overwhelmed, the older boys in midfield did make a decent fist of it, so I came away with some positive thoughts even if I wasn’t anticipating any points on the board for a couple of weeks yet. The reason was that our next match was away to who by now were the runaway leaders, Wormley Rovers. Whilst we were still in 4th position, we were 14 points behind the leaders, the same margin we were ahead of the last-placed club, Holland-on-Sea, who’s be coming to the Memorial Ground the following Saturday. 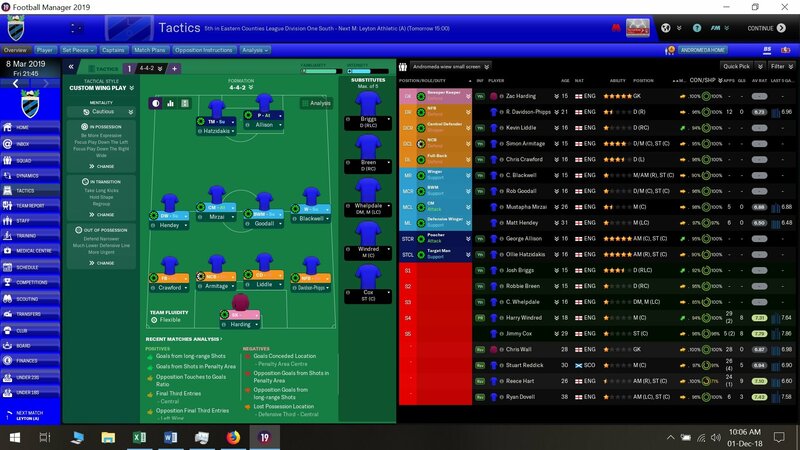 What I did do against Wormley is prepare a different formation, 4-3-3 largely because we’d run out of viable defenders (another left in the week leaving us with four kids) and had midfielders eager to show their worth. And it happened. It only bloody happened. Wormley Rovers were all over us but every lad stood their ground, played with a semblance of passion and, against the run of play, stole a goal to win 1-0! The goal was scored by one of those 15-year-old defenders recently brought into the line-up purely because he was still on the books. Social media was raving about the new tactics – was that it? If I’m hailed a genius so be it, but in truth my options were severely limited given the few players left to me. As I’d suggested, one fluke result and we have an ecstatic camp once again. I’d meant to bring Chris Wall back in goal but the 16-year-old has made himself undroppable for the moment and with bottom-placed Holland up next, I wasn’t going to change anything. Given the fickle nature of the game, an unexpected bonus of our victory was that Gradi actually persuaded someone to sign forms – another record wage too – and we have ourselves a 29-year-old Essex journeyman striker. It’s defenders I need, not another striker with a Determination of 2. He was followed through the door by a left midfielder, whom I absolutely didn’t need and would have to change to a 4-5-1 to corporate him when I’d just found a successful 4-3-3 formula. Cheers Dar. Whether connected to the signing or not, our captain immediately announced he was happy with the locker room now, and the rest of the senior players who’d sided with him began nodding in my direction once more. Hmm. And we’re back! We really are. At 1-1 I brought on our new highly-paid striker and he scored a brace and set up another for a 4-1 win. So everyone’s happy, except me as I’ve got a headache working out how to change a winning formula to integrate these new unasked-for players. It seemed to me a 4-1-4-1 would work best, but it did involve sacrificing Reece Hart on the right wing, our vice-captain and one of our best players. We’d see how it went against Burnham Ramblers. As I inculcated our new system during training, Gradi brought me yet another granddaddy striker (38 ffs!) – some Dorset type also on a promise of silly money. 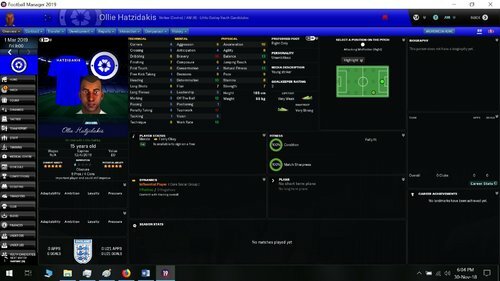 He was fit enough so I threw him into the starting line-up with the other guy to start on the bench again until he got his fitness levels up, but “Dario”, I said, “Please can you dedicate yourself to our academy now – in six weeks I need you to deliver me special young local kids, don’t neglect them now.” He acquired another mature midfielder with no discernable technical ability or steadfast character, but who expects to play in the captain’s position. The Ramblers are a good side and we came away from Burnham-on-Crouch pointless, losing 0-2 but I thought we played okay and I was happy to see more of that formation in coming matches. I couldn’t though, now the two highest-profile players on our books were aged strikers, so I had another go to fit everyone into a 4-4-2. February opened in a blizzard, sleet shearing off the North Sea as we battled May & Baker, whose name conjures up a combination of Boney M and a hint of exceedingly good cakes. With yet another trial formation and five starting players having played one game or less, we were again venturing into the unknown. Whilst our wobbly 15-year-old central defenders succumbed under pressure, going forward we looked better than we have in many moons and ran out with a 3-1 victory. Dropping our captain and vice-captain seemed to have helped, but I’m not sure how that will go down long-term. 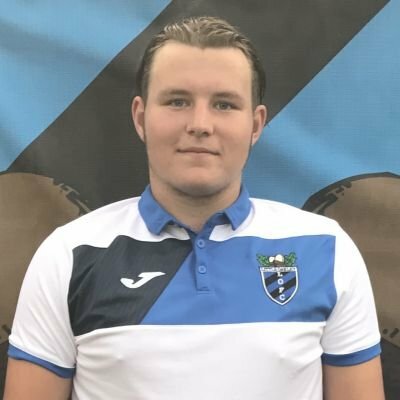 Our temporary captain, Sam Eldridge, was playing only his second game and is only in as we’ve switched from a pair of attacking wingers to two defensive wingers. He and the new defensive left-winger Matt Hendey put balls in for the two new strikers, Jimmy Cox and Ryan Dovell to score, before Eldridge scored and got Player of the Match. I dunno, maybe Gradi knows what he’s doing after all? Could we repeat the feat if I avoided any tinkering and let the starting XI gel while we headed west to Cressing Road and Braintree’s reserves? Almost. Against stronger opposition, away, facing impossible odds according to the bookies, with the help of a missed penalty we drew 2-2. Pleasingly, although there were no stand-out performances, we’re putting some consistently decent play together on the pitch, and we have three winnable ties coming up next. The first of the three was home to Benfleet. I had to tinker a bit as I have three 15-year-olds (and a 17-year-old) in my back line including one who holds the fort at the problematic left-back position. I have to keep recycling them, dropping one at a time to ensure they stay reasonably fresh. So, 5-0 with braces for Windred and Cox. The whole team played an absolute blinder, constantly deadly going forward, solid at the back. After that match we lost three more fringe first team players, one to rivals Hashtag. To be fair, these are boys who’ve lost out to Gradi’s undoubted upgrades, and they were painfully aware that with Academy Intake day looming, they were best off leaving with dignity intact. It has left us down to the bare bones, but surely big things are due after the next pair of fixtures. Next to go under the sword were the Portugueezers of Lopes Tavares. Slaughtered them 5-1 with braces from each of the front two, Cox and Dovell. The performance was probably the best I’ve ever seen a Little Oakley side produce. It’s staggering that most of these boys went on a seven-game losing streak barely weeks ago. And what a shame there’s nothing to play for. As February rolled into March, we were all getting excited about luring our closest and bitterest rivals, Harwich & Parkeston, into our lair and giving them a right caning. Bottom of the league, they were there for the taking. All of that was forgotten on the Friday prior, however, when Dario rocked up with a gaggle of the town’s comprehensive school lads – our first new academy intake. As I ran the rule over them and checked Gradi’s reports I thought to myself, “Dario, I take it all back; you are the MAN!” Take a look yourself – these kids look the BIZ. Dario wanted to focus my attention on two treasures – this guy: determination!!!! All of them look considerable improvements on our back up players, so I’m happy that the gits all refused to sign contract extensions and hopefully Gradi will shift them out in the summer. I guess the distractions went overboard – maybe it was my fault, but when the football match inadvertently broke out, we got spanked by Harwich 1-4. It wasn’t what I intended, but the ‘Dovercourt Massive’ sat alongside me watching the match before they turned out to impress me in the evening must have thought, “We’re better than this shower”, and they will now get a chance to demonstrate that in the coming weeks. What a foolish time the hitherto first team chose to embarrass me and themselves in front of a record home crowd. There are seven meaningless matches left in the league this season. Seven very meaningful matches if we use them to integrate our new lads and work out the best combinations and tactics so that we can hit the ground running next season – and my first instincts tell me that we have much of what we’ve been waiting for to set the pace and avoid the calamitous collapse that hit us this time. Radical changes incoming! By Wednesday Gradi had sorted out twelve youth contracts, with eight going into the first team squad for a closer look. I let two go as we had a surfeit of left wingers and they struck me as slackers in a mould too similar to what I’d reluctantly been putting up with. So here’s how we went into our first match with the new generation – eight excited kids took to the pitch at Leyton, with three more on the bench. Note these names - the new little acorns! Proud parents filled a bus and made a racket throughout the match at Leyton. I told the boys not to worry about the result, and in fact we started off well ropey before gradually growing into the game. We conceded two first half goals due to slack marking at a corner and free-kick – that’s on me as I didn’t find time to prepare them on set pieces. In the second half the boys gave it everything, pulled a goal back and very unluckily hit a post. We had the best of the half by far, and even though the final result ended 1-2, I told the boys I was delighted with their performances, and I was. For me they key was that they never let their heads drop. This looks very promising indeed. Dario Gradi has proved himself to be an outstanding Head of Youth Development and just what our new Youth Academy needs, but as a Director of Football? Well yes, he brought in some old boys to significantly improve the old squad, but if he’s going to bring in warhorses now, they need to be strong characters suited for mentoring to bring out the potential in our young charges. Instead he keeps tapping up old boys looking for a last hurrah and I’m on the blower trying to undo his faffing about. Mind you, even a stopped clock’s right twice a day and he somehow got something right, getting me a 17-year-old right back from Benfleet – he’s going straight into the next game. What’s more, I instructed Gradi to shift out a dozen players who are surplus to requirements and he’s antagonized them so much they’re weaponising with agents and stirring things up. Back down the A12 to play the saucy sailors of Basildon, White Ensign. Being in with a shout of winning the league and gaining promotion, they’d be up for it and a good test of mettle. Two of the new kids who came off the bench against Athletic started, leaving only one non-teenager in the starting line-up. And whaddaya know? The boys dug deep, gave no quarter, and in stoppage time Hatzidakis was sharp enough to leap onto a goalkeeping fumble to poach a win, 1-0! We spent the week on training, working with the coaching staff to devise new individual training regimes for our young charges. It’s all new to them but they all showed willing, which was a refreshing change. I commended our front two in particular for giving it their all on the training ground. We spent some time on defending dead balls too for the visit of rivals Brightlingsea Regent reserves as I sent out the same starting XI. A solid 3-1 victory with two goals by our new skipper Hendy (ie the old one old enough to vote! ), and some nice work by our young keeper covering defensive lapses confirmed that we’re very much on the right track. Perhaps the most pleasing aspect was the new record crowd of 182 – double the norm until now – for a home league game, indicating it’s not just the parents showing support – there’s a buzz about the village and beyond, in Dovercourt and Harwich Yes, they’re all school kids on a discount, but they do create a great – if high-pitched – atmosphere). I was sorry to see Chris Wall depart – he’d made 28 mediocre appearances between the sticks, but he was too old to fester in the reserves and needed to play. However, I was quite happy to see Gradi bring me a 24-year-old right-winger to cover for Blackwell. In fact, we’re just a couple of players short of having cover for all 11 positions now. Gradi brought out a list of players and staff whose contracts run out in three months, asking for my thoughts (he’s clearly starting to respect me now). It’s not my final say, but I had to point out that like Wall, those eight stalwarts of the club belong to the past, not our future. More to the point, our spanking new academy leaves our training facilities looking limited (which we can’t do much about) and the same has to be said about the staff. “Who do we keep on Dario?” None of them have more than two star ability; could Dario find us better quality? I left it in his hands. Thirty minutes along the A120 brought us to Coggeshall. Wham bam, on a roll, 2-1, three points. April brought our roller-coaster of a first season to a close. Our final home game would be with Frenford, then we’d close out the campaign with visits to Hackney Wick and Hashtag United. None of the clubs had anything to play for, but my boys had points to prove to stake claims for the next season. The board were also looking to the excitement of the next season and put a contract extension under my nose. I haven’t had any other offers and I felt as if I had even more of a point to prove than my young charges, so I gladly agreed to stay – with my wife! 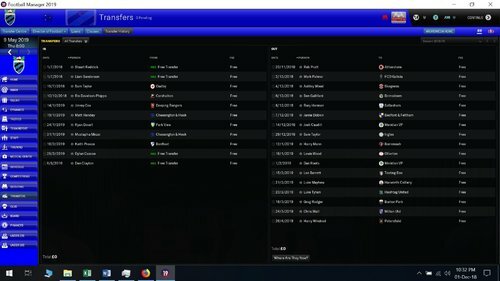 I asked for a cheeky pay rise of 500 squid to two grand per month, and was confident enough in the following campaign to request a 50% increase should we win the league. It was all granted. The Dovercourt Massive put on a good show for their families and friends as we dominated Frenford in a comfortable 3-1 win. All the goals were headers – we’ve added some height with this intake, making crosses and corners more effective; hopefully we’ll prove better defending set pieces too. The familiar trek down the A12 took us to the delightful if blustery Old Spotted Dog for our encounter with Hackney Wick. 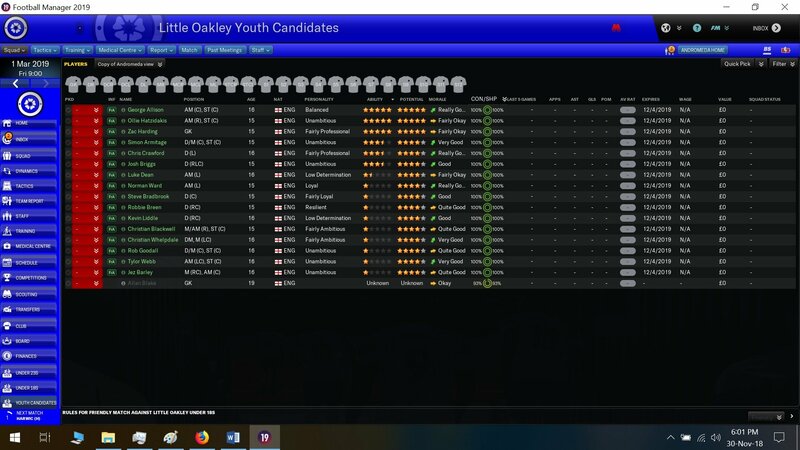 I gave me the opportunity to assess Dylan Cascoe, our new right-winger, as well as tweak the full-backs. All three impressed in a well-balanced side as we ran out 3-0 victors. 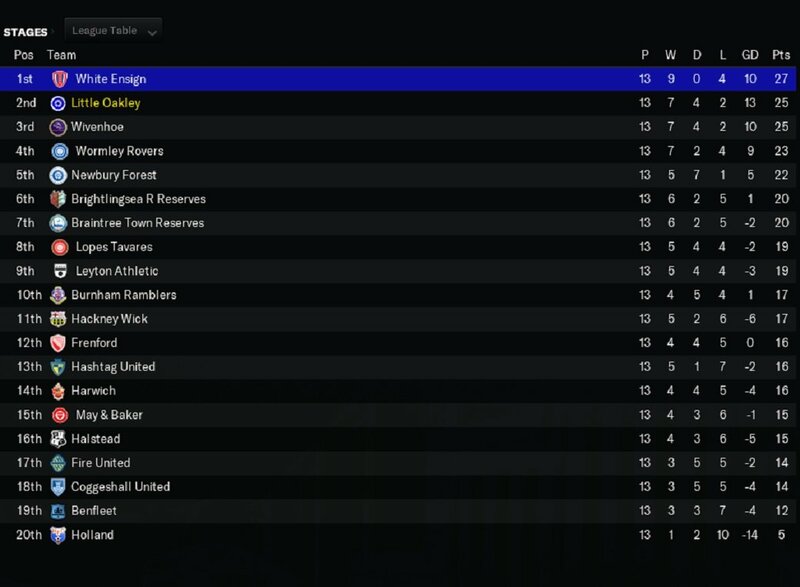 We would finish the season in a fortnight in third place, an extraordinary feat. 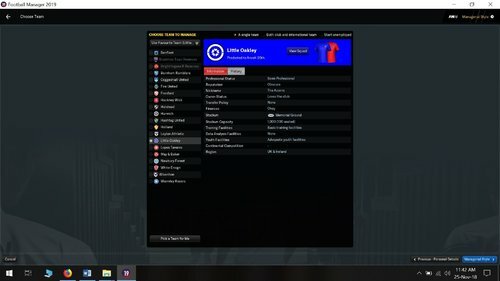 With a free weekend due before the final fixture, I decided to set up a home friendly against local rivals Ipswich Wanderers, mostly to reward our supporters and bring in a bit of cash. It was a nice run-out, further helping the lads gel, and we took a 4-1 win. After the game we said a fond farewell to fat Harry Windred who put in 32 great performances for us. Still only 18, I’d liked him to have stayed in our first team squad, but he wanted guaranteed first team football and I couldn’t stand in his way. A final-day trip to play Hashtag United was unspectacular, but a 1-0 win extended our run of victories to seven. 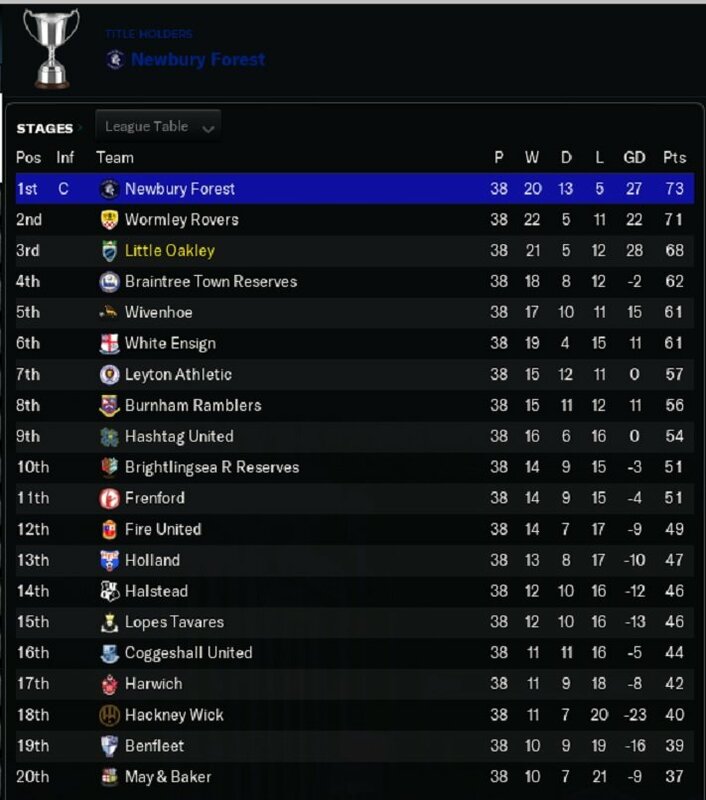 Of greater interest were the shenanigans in a couple spots nearby; Newbury Forest and Wormley Rovers had both been choking themselves for weeks trying not to get promoted. It was Wormley that went down at home to hand promotion to Newbury. We’ll have to wait and see who replaces them, but I’m quietly confident we’ll be favourites to follow. 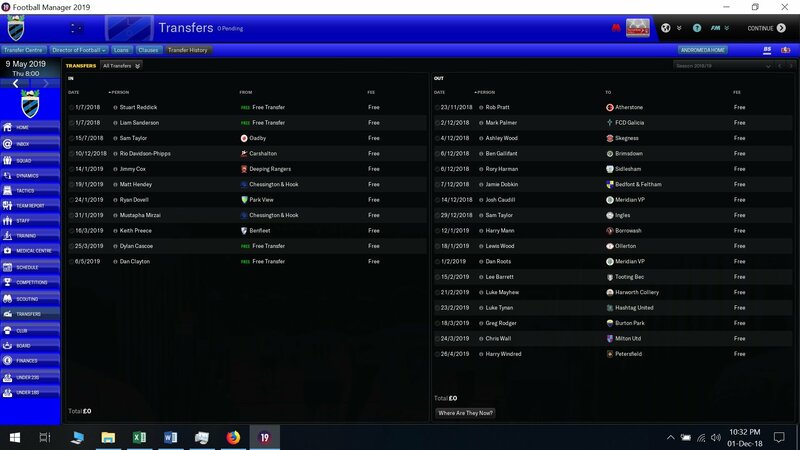 Here is the transfer history. Every one of the leavers was lovingly crafted by me in the editor, with player pics added as they are real-life Little Oaks. They all either jumped ship during our poor run or saw the writing on the wall. There will be a major clear out in June as contracts end and other players find themselves usurped by young pretenders from the academy. Many of them either work locally or are at school in Dovercourt or Harwich. I hope they still support us and appreciate it's just business. Whilst it's not my remit, I do note that our greatest expense by far is the staff wage bill. Now I realise that the lion's share is eaten by me and Dario, but I still think we have a lot of bloat , and can reduce our staffing levels. That we finished with a healthy balance was entirely due to the generosity of the local council's grants funding our academy and other running costs. I have no idea if those grants will continue. Around the country, in the Premier League there are new champions as Liverpool took the title ahead of Spurs, Man United and Arsenal respectively. Pep got the boot, as per. Huddersfield and Cardiff were cut adrift long ago but Newcastle lost out on the final day. Aston Villa, Norwich and Stoke will replace them. Our neighbours Colchester United won promotion from League Two, while neighbours of half our rivals, Boreham Wood and Ebbsfleet got into the Football League, and Maldon & Tiptree were up too. There’s plenty of camaraderie at our level of football – even rivalries are good-natured. Thus it was that we empathized with the dejection of the lads we played at Braintree and Brightlingsea Regent reserves, the parent clubs of both were relegated together with White Ensign’s big brothers at Basildon. In Scotland, Celtic won their championship for the eighth season running whilst Aberdeen were runners up. East Kilbride were promoted into the SPFL. In Wales, The New Saints matched Celtic’s eight-in-a-row, Glenavon took the Norn Iron title, and Dundalk had won the Proper Irish pot months previously. Finally, way down at the foot of the Rock, Lincoln were Gibraltarian champions for the eleventh time in the last twelve seasons. Dario Grady brought in four interesting-looking teenagers during June although I can’t assess them until the squad is back from their summer break. Then, after chucking new contracts at all the staff, he promptly announced his retirement – with one day’s notice! I sat down with the wife – “What do we do then? How do we replace him?” “Do we need to?” was her response. I think between us we’ve learned the ropes well enough. I want us to focus on our academy products 100% from now on; I’ll manage all contracts, you’ll take over other responsibilities and we’ll work more closely with the head of the academy, giving him title of Head of Youth Development.” And so, just like that, our Head Coach challenge was over! Except it wasn't, quite. Then she went and appointed some numpty after she decided that she didn’t feel confident enough. 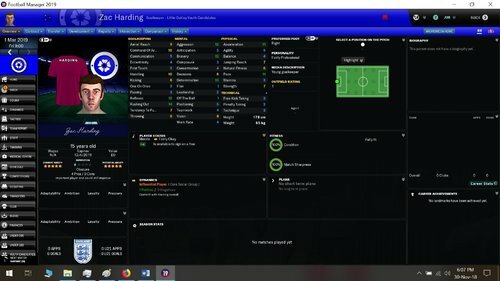 Still, I’ve been given more responsibility; I’m not renewing a few player and staff contracts which will save us some money, I’ve found a Head of Youth Development who has a professional temperament and similar playing philosophies to me and I’m trying to improve the quality of coaching. We’re entering an Under 18s league this year and …. The FA Cup! Hmm, the big news is that after Klopp won the Premier League with Liverpool, he’s defected to Manchester City. Allegri is in at Liverpool. Wolves can’t do boring – after a poor run they fired Espirito Santo and replaced him with Bielsa – in the Premier League at last! Newly promoted Villa are managed by John Terry. His mate Frank Lampard took Derby down to League One and lost his job. 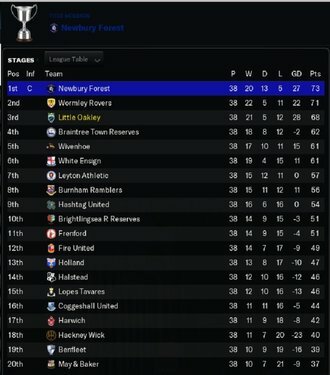 The board and the bookies expect us to be around the top – in fact with only the reserves of Braintree and Brightlingsea, who can’t get promoted, tipped to finish above us, realistically that means we have to win the thing, which I believe we can do even if the squad didn’t when I addressed them before the break; however, they’re on board now. I gave the boys a long break with an intense season in mind. We had just two weeks to get in shape and re-familiarise ourselves with our tried-and-tested 4-4-2. Just three of the first team squad needed bedding in. My only concern was that we might not be sufficiently match-sharp for the FA Cup preliminary round – hopefully that new venture wouldn’t be too brief. My pared-down squad now consists of 18 in the first team squad and 14 in the U18s squad (with no full-backs). Frankly, none of them (well maybe two) will make the step up and I expect to move whoever’s left on when the next intake arrives. We won’t have an Under 23s squad but I might rustle up the odd friendly to keep fringe first-team squad members alert. 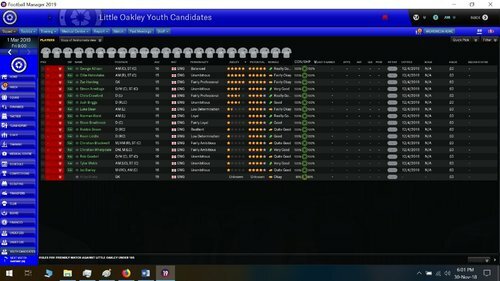 There are four older members of the squad I’m trying to get rid of but who don’t want to leave (including two who turned 19 and are ineligible for the U18s). My ruthlessness has left me with a first-team squad who have gone from having the poorest determination in the division to the highest. They’re a professional bunch too. What I’ve lost is quite a bit of pace throughout the side and quality (and numbers) in defence. I need to try to minimize those weaknesses through my tactics whilst hoping to fill the gaps next March. The friendlies were functional with nothing to report although we could have done with one more to better get us into shape. The draw for the Preliminary Round of the FA Cup sends us to St. Neots in Cambridgeshire to meet Eynesbury Rovers. I confess I’d never heard of them, and I sent my newly-appointed scout Ross ‘Taffy’ Williams to watch their next pre-season warm-up. They play in a league a level above us but Ross gloomily assessed that they’re more like two levels above us. It would be a tough tie. He also chirped up with some anecdote about Sir Stanley Matthews once turning out for them. I’ll secretly admit – I was a little bit awestruck. 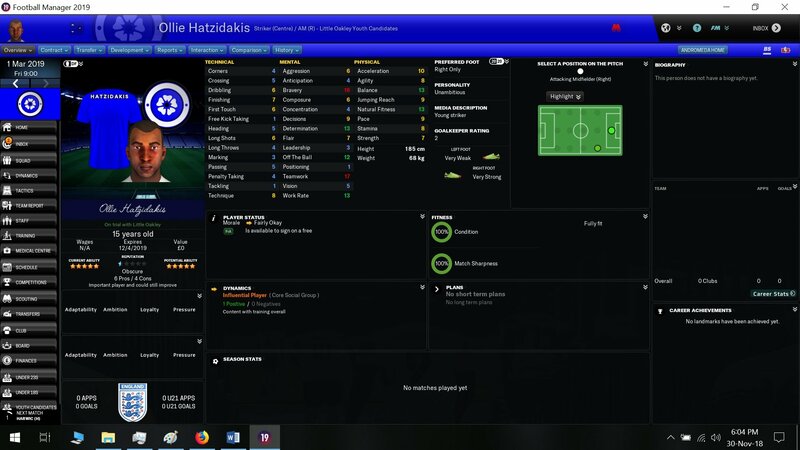 We’re used to clubs looking to poach out better players, but professional outfit Chesterfield are looming over our star youth striker 16-year-old Hatzidakis. This is a problem. He’s a local, Dovercourt boy, loves his town, loves his club, is close to the U18s coach, and enjoys the bragging rights of getting one over his rivals; as Clacton were here for our final friendly, I stuck him on the bench and promised him 30 minutes if he’d sign the part-time contract I slapped under his nose at half time. He demurred, and we lost the match, but not to be deterred, I insisted he’d be in the starting line-up in three days to kick off our new season, and the following Saturday in the FA Cup tie. I urged him that he needed first team football with us to develop rather than in the youth squad under a crooked spire. While I worked on the kid, our chairwoman accepted an offer for Hendey, our only back-up left winger. Finally our season was under way, with the visit of Frenford over whom we did the double last season. In one sense it was a warm-up for the FA Cup tie the following Saturday, but we’d have to focus on earning the three points from the league opener. On the morning of the match, Ollie Hatzidakis signed his pre-contract and went on to play with great enthusiasm – as they all did. Our total dominance wasn’t reflected by the 2-1 margin, which was more due to cobwebs in the shooting boots and a silly penalty. With all my effort focused on the cup tie, on Thursday Hatzidakis was gone. Not to the Vanarama, but to the Premier League. The chairman had not hesitated for a moment – or thought to consult me – when Brighton called. Fair play, we couldn’t have denied the lad given he’d learn at the feet of Fabio Borini whom they’d also acquired – for money, but she never even asked for any compensation. Plus, I had to bodge together at the last minute a new attack for the biggest game in my career. Cheers for that. Friday saw me in front of the box suddenly not enjoying Transfer Deadline Day. Hazard to United, Mane to Real, Zaha to Chelsea for money, dear chairwoman! So at Eynesbury, I threw in a kid I’d barely played in the Under 18s and sacrificed midfield creativity for an enforcer. We were going to have to mainly rely on lobbing the ball up to young George Allison, 16, also closely watched, and our best young hope. For the first hour we just didn't turn up. Slower of thought all over the pitch including in the box where we lost a goal to a clumsily-conceded penalty. 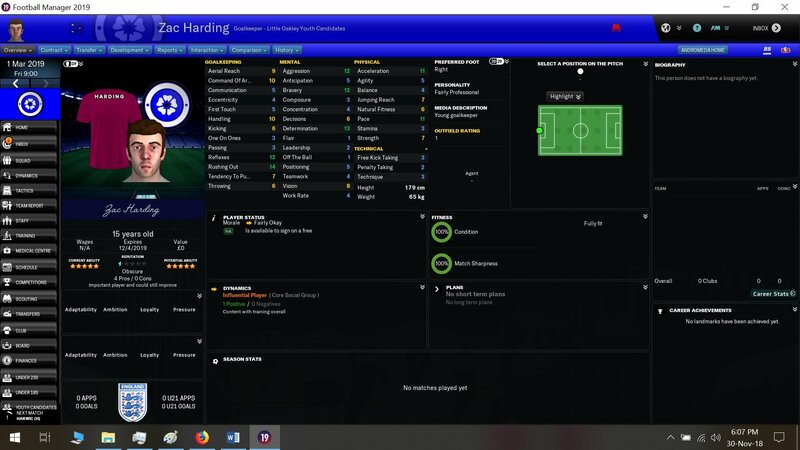 On the hour mark I rectified my mistakes and took off the untried kid for 30-year old Jimmy Cox, and replaced the holding kid for our club captain and attacking midfielder Stuart Reddick, also 30. With that experience we immediately equalised through Allison and were all over them, peppering their goal. We'd have massacred them if not for their superhuman goalkeeper. I was fretting that I'd failed to check if we played extra time or not when in the 93rd minute Briggsy back-heeled their only shot into our net. 1-2. Tragic, undeserved, an ignoble 'run' in the cup in which we failed to get to the preliminary stage. Still, if the wife is intent on gutting our bare-bones squad, we couldn't compete on two fronts anyway. Let this be a lesson to the board!